In step with the popularity and growing momentum of Maker Faire, the "maker movement" is going global with the help of the Exploratorium museum's Global Studios. After 40 plus years of work in this field, the Exploratorium, which is based in San Francisco, is stepping up its involvement in hands-on, informal science and technology education by working with groups across the world to spread and grow the movement. In addition to participating in all the Maker Faire events, bringing mini Tinkering Studios™ where visitors can experiment with the activities freely, the museum has also been called on to teach these ideas in far-reaching spots like Saudi Arabia and Italy. “Tinkering is not something we invented or anyone invented,” said Luigi Anzivino, scientific content developer for the Tinkering Studio in the museum. “I think it’s a fundamental way that human beings have of being in the world. There’s nothing that we’ve discovered about this. So, it belongs to everyone. All we are trying to do is reveal that and allow people to let that come to the surface." Educators from around the world have asked Anizvino and his staff to facilitate similar learning experiences and to set up parallel tinkering studios. Anzivino has noticed an interesting phenomenon: it's challenging to get even the most ardent "tinkering" enthusiasts to stop “teaching” and let a student explore. And a whole other challenge to see the value in “content” disconnected from a specific academic goal. 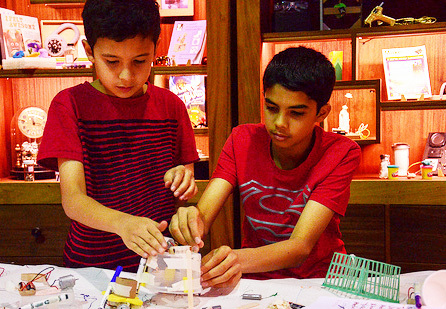 Sparking an interest in science, engineering and design is increasingly a priority for educators, museums and even governments around the world. “We think it really unlocks potential in individuals, potential in society, potential in terms of advancing science, technology, art, all of those things,” said Silva Raker, director of Global Studios. For her, the project is finding pockets of interest in this work anywhere it exists and helping to nurture people who want to see it grow. The Exploratorium has a long track record of cultivating a national network of inquiry-based educators through the Institute for Inquiry which trains teachers in the learning techniques used to make science fun at the museum. “Frank Oppenheimer [the museum’s founder] believed that one of the great ways to scale the impact of the Exploratorium was to work with teachers because over the course of their careers they’ll interact with many thousands of kids,” Raker said. They're also cultivating networks of educators around the nation interested in this work and supporting them to become facilitators of inquiry-based learning. This work mirrors what will come out of Global Studios – where educators approach the Exploratorium for help designing, setting up and putting into practice Tinkering Studios or other exhibits. Anzivino went through years of training to become a neuroscientist before he found the Exploratorium. He says his traditional schooling helped him to fully appreciate what inquiry-based learning and tinkering can mean to kids. “It offers an opportunity to decide for yourself what it is you are interested in learning,” he said. “And to be validated in your own path toward finding the answer, even if it goes nowhere, even if it’s full of false starts and avenues that go nowhere.” And that, in and of itself, is a little radical.